Help keep your garden hose organized with the Panacea Star Hose Holder. A metal star graces the front of this holder, surrounded by a ring. Three metal rods behind the adornment create a place to wrap your garden hose, to keep it off your lawn. Use hardware to mount the back frame of this holder to a wall or post, creating a stand for the hose. 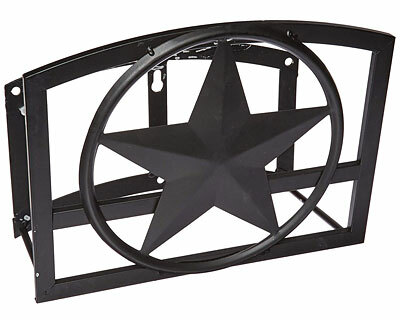 The black color adds a timeless look, while the powder coating lends durability. The metal construction will withstand the elements for a sturdy hose holder for several seasons. Keep your watering equipment tidy with this Star Hose Holder. Note: This description refers only to the Panacea Star Hose Holder. A post is not included.